Beaufort Manor House is an attractive mid Georgian manor situated just off the Ring of Kerry, five miles west of Killarney. 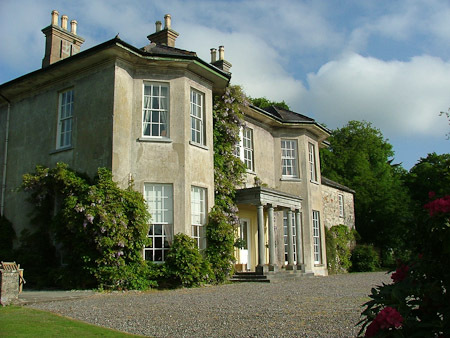 Set in forty acres of woodland overlooking the River Laune, Beaufort Manor House is ideally placed for exploring the many attractions of Kerry. The original building on the site was a short castle, so called because it was only two stories high, built by Captain O’Sullivan in 1641 and attacked by Cromwell’s forces in 1654, the west wall being demolished. In about 1760 the present house was built, the remaining three walls of the castle forming the hallway. The interior was altered in 1830 and the chimneypieces and plasterwork date from this time. Totally refurbished in recent years Beaufort is now available for holiday rentals, offering four large double bedrooms, each with king-size beds convertible to twin (two single beds) and en suite bathroom. Reception rooms include a drawing room, library and formal dining room. In 1998 the 18th century stone courtyard was converted to provide additional accommodation in four superbly appointed cottages. These are four-star rated for self-catering by the Irish Tourist Board. They are named after Killarney’s rivers. 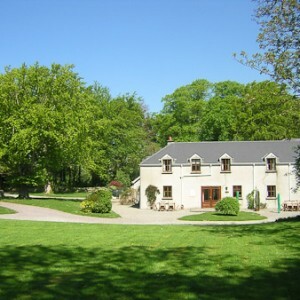 The largest, Laune, has four bedrooms, Flesk has three bedrooms and Torc and Keal each have two bedrooms. 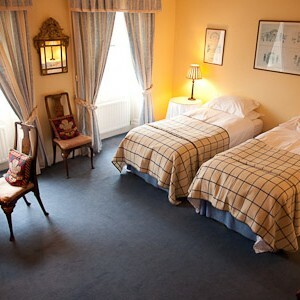 The comfortable sitting rooms have warm, open fires, CD stereos, televisions and video recorders. Each cottage also has a utility room with washing machine. The two larger cottages have especially spacious dining areas and sitting rooms, ideal for entertaining. All the bedrooms are equally spacious with king size beds, convertible to twin, and every bedroom has an en suite bathroom. We provide all linen including Egyptian cotton bed linen and bath towels but beach towels are not provided. The kitchen / dining room areas open on to south or west facing terraces with views to the mountains. The kitchens are equipped with gas hobs, double ovens, microwaves and dishwashers. To reach us from Killarney take the N72 (marked as R562 on older maps) (Ring of Kerry) west towards Killorglin. 5 miles out of Killarney there is a petrol station on your right and a stone bridge on your left. Cross the bridge and the gates of Beaufort House are immediately on your left as you come off the bridge.